The inefficient design and operation of the company’s financial reporting system was undermining its ability to gather and manipulate important data quickly and was wasting valuable employee time. After implementing a deFacto Global solution, the financial team’s ability to obtain, process, and customize data for reporting and forecasting purposes improved dramatically. 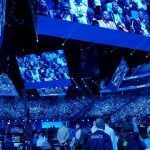 The results were so impressive the company extended the deFacto solution into new areas of its business. The company had been using Enterprise Reporting System as its means of loading data and reporting. The process was complicated and did not allow for aggregating reports for each of its member companies or enable easy transitions between adding new data categories and loading the data. Additional limitations were imposed by the data having to be processed for one company at a time. The excessive effort required by the staff to perform these tasks took a toll on valuable employee time. Further problems stemmed from the used Excel for financial reporting, a process that required a lot of copy and pasting, report linking, and multiple spreadsheets to generate a single report—all of which increased the risk of manual error and broken links and formulas. The Enterprise Reporting System allowed for reporting in a single standardized manner, with no ability to customize reports. In addition to the financial reporting limitations, the process in which budgeting and forecasting were completed entailed a time-consuming and inefficient method. The company realized the need to replace its current system with a more sophisticated application that would improve its reporting, budgeting, and forecasting capabilities. After investigating potential replacement solutions, the company chose deFacto Global’s Performance Management application because of its power, flexibility, and affordability. deFacto’s multidimensional structure and comprehensive integration packages allowed the company to greatly improve the time of loading data as well as data integrity. With deFacto, data could now be loaded and processed automatically or on-demand, and for all companies via a tailored integration package. Reports and input schedules were now user-friendly and could be customized according to the company’s needs. Data could be seen real-time with an Excel add-in application that allowed the cumbersome links and formulas to be removed. 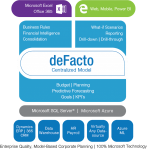 deFacto’s advanced capabilities enabled the financial team to perform operations to meet its specific reporting and budgeting needs. For example, if a budget was submitted and an update needed to be made, data could be copied into another level and edited using deFacto’s “version” dimension, without the risk of data manipulation or loss. Likewise, by using deFacto’s “currency” dimension, data could be loaded based on its currency without requiring a step for translating. 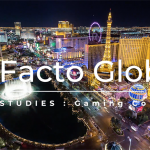 Implementing deFacto Global has given the company a dramatic boost in capability that has enabled it to achieve a significantly greater return from its reporting and budgeting/forecasting operations. The financial team is able to track all of its reporting companies in one step, without the previous wait time caused by having to handle each company one-by-one and for multiple reporting periods. Data can now be submitted more easily and frequently and processed in real time. By using deFacto as the sole producer of Excel reports, the risk of manual error and data manipulation caused by broken links has been eliminated. By engaging in a hands-on learning approach for report building, the financial team is able to get a running start on developing customized reports that enable them to produce faster results, all of which enables them to focus on the bigger picture: their client network. After seeing the positive results and improved efficiencies from this initial implementation of deFacto, the company decided to move forward with the second phase of implementation involving a personnel management dimension. This new capability enables employee salaries, new hires, benefits, and related expenses to be managed in one place and directly fed into the budgeting process. The system streamlines all the processes involved in employee management gives the company a better handle on when to expand its staff. The company operates intelligent commerce networks in three main avenues; Promotions, Supply Chain, and Healthcare. The firm provides a platform for real-time transactions to be securely managed by leaders across multiple industries, enabling the partners to gain valuable insight into the shopper’s needs. What began as a business of clearing coupons has emerged as an innovator in applying technology to complex transactions for over 30 years. By promoting a collaborative and teamwork approach, the company acts as an intermediary to providing value to all aspects of the commerce network—including retailers, manufacturers, traders, and consumers.